Yes you read it right, we manufacture custom beds as per your design. 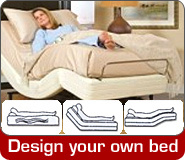 We are asking you to customize your bed as per your choice, budget and requirement. At D4 Surgicals we believe in the process "You Design, We deliver". In case designing your bed has brought shivers to you, then don't worry you just need to select the pre defined components and accessories for your bed as per your needs, and if any time you need our help please simply fill up the inquiry form and we will contact and guide you to what will be the best product combination for you. Any specific requirement / request you think will be necessary while we manufacture your bed.